The Little River Blue Crab Festival is an annual event that takes place along the historic waterfront in scenic Little River South Carolina. Although the Blue Crab Festival has become recognized as one of the Myrtle Beach area's most popular festivals, the town of Little River is quite different than Myrtle Beach, the flashy tourist town about twenty miles to the south. Up here on the north end, we enjoy a slower pace, a more family oriented lifestyle, and most of us know our neighbors and those who live down the street from us. 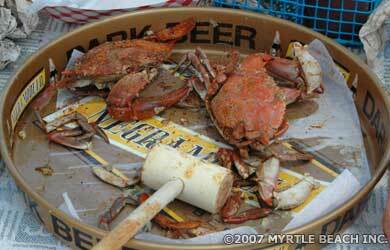 In 2011, the Little River Blue Crab festival celebrated its 30th year. The popular festival was started three decades ago by a small group of local artists and waterfront residents. It is now the largest annual event in Little River and continues to attract thousands to our scenic waterfront each passing year. The original purpose of the festival was to support the waterfront businesses. As decades have passed, the festival has gone from the control of the original waterfront locals, to the chamber, to a private corporation, and now to a collaboration of different entities. The Blue Crab Festival is held annually at the Little River waterfront on Saturday and Sunday, the weekend following Mother's Day. See the previous years Blue Crab Festival photos of the arts and crafts booths, games and amusements for the kids, the camel, baby baboon and other animals at the children's petting zoo, the live entertainment, and fresh seafood and more during the two fun-filled days of the annual Blue Crab Festival at the Little River Waterfront. And we'll see you at this year's annual Blue Crab Festival at the beautiful Little River Waterfront! While you're in town for the festival, check out Myrtle Beach Nightclubs the area's restaurant news and reviews and Myrtle Beach TV for streaming videos.